I've said it a thousand times before so please forgive me for repeating myself, but I really am so grateful that this blog gives me the opportunity to earn a living to support my family from home. I will always be so grateful for having had the opportunity to spend my childrens early years with them here in our home whilst not having to give up an income that we so need. If this blog hadn't been an option, our financial position means I would certainly need to go out to work which I know I would find really difficult as I'm such an anxious parent and I have so many issues involving trusting other people with my children. I've also said before that doing this as a job doesn't come without very hard work and struggle - people see parcels arriving at the door and sponsored posts going up on a blog and assume it's an easy living - I've spoken before about how difficult it actually is, how many hours work and dedication it actually takes. But, as with any job, there needs to be a balance between home life and work...which can be especially difficult when the two are so very intertwined. At the moment - I'm struggling. I'm finding it very difficult to find the right life balance for us. One of the problems I have is, because this kind of work is based on how active/relevant you and your stats are at any one time - any down time can be detrimental to your work. And as someone who struggles with control issues, I find that difficult - so difficult in fact that I didn't even take a full day off when I had Noah - instead I sat there in my hospital bed that night responding to work e-mails from my phone while he slept. And now so soon after that I'm going to find myself in the same situation - recovering from another c section, adjusting to life with another child, with no down time. I don't mean this to sound like one big complaint, that's really not my intention - if I didn't want to do this anymore I would stop. I do want to do it - I still have a lot of passion for it - but something has got to give. They say you should never turn your hobbies into your work for fear of losing the enjoyment from them - and I can see how true that is now. There's always that need to keep up with the pack - you must be better, you must try harder, you must give more. Or else...you'll be left lagging behind. I've taken the decision to cut out the elements of this work that I enjoy the least. For me, vlogging and filming most videos is not enjoyable - a lot of my confidence was sucked away by my recent experience with a YouTube Channel, and since then, although I've tried to get my head back in the game, I've struggled a lot to feel confident in front of the camera again. I feel that when I try to film our days out as a family or any of our time together, I can never quite relax in to it - I always feel on edge, I'm always conscious of whether or not I've got the right angle or whether I've taken enough footage and it stops me from living in the moment and just enjoying the experience with my family. I find myself getting snappy if Tyne is misbehaving or doing anything I wouldn't like to see on camera and that is AWFUL and not the kind of mother I want to be or want him to remember. A few days ago, while we were baking together, I got my camera out to record us (The baking set had actually been sent for review so it was necessary, but still) - Tyne saw me and immediately said "NO Mummy, I don't want to be filmed!" - that's something that's really stayed with me. How can I over-rule that? He told me in no uncertain terms that he doesn't want to be filmed - I can't just go against that can I? Surely that isn't fair. So I sat down and thought about it...Why would I want to continue to do something that I feel detracts massively from my personal time with my family all for the sake of more hits, more followers, another string to my bow, another figure in a media pack, and possibly more work? But when this is where your bread and butter comes from, it's also very difficult to know when to switch off - when to step away. Finding the right balance is a constant struggle. With smart phones such a big part of everybody's lives now it's like the pull to "work" related things is always there - a quick check of how a post is doing today or if I've had any social media messages is all too easy with my phone so close at hand and before I know it a quick glance at that phone has turned into 15 minutes gone, just like that. I find that activities with the children always end up becoming blog fodder - I'll tell myself we're doing something just for fun, just for US - but someone will look cute, or I'll think that this would just make SUCH a cute social media share and there I am rushing off for the camera yet again and there we have it - once again, a private family moment has become an element of work, has been shared with everybody else. I love recording our memories for us to look back on in years to come of course and I don't want to stop recording them completely...Tyne himself is the biggest fan of our YouTube videos!, but I don't want the children to always remember a camera being involved. I don't want them to think it always about being shared, getting hits, getting likes. I don't want them to grow up, look back and to feel used. I realise that women in any field of work will have these times when everything just feels like it's all too much, but I do feel that this kind of work becomes very muddled in with every day life so very easily....you're essentially sharing yourself, your children, your life with the world...perhaps it's just me but I find it so hard to know when to stop, where to end that work day, where to draw that line. It's a scary time at the moment, worrying about managing life being heavily pregnant with two such young children to look after, worrying about how we'll manage our time when the third one arrives - I need to take away the strain wherever I can. I think that's all any of us can do - just do what we can to lighten the load, and keep on keeping on. I hope I find a way to fairly weigh everything up soon, because this balancing act is becoming evermore difficult to juggle. How do you manage your work/life balance? I'd love to hear your thoughts! I think sometimes we forget that balancing is not a consistent thing, it's like a see saw we have to keep shifting things to try and reach an equilibrium. I really love your posts (like this one) when you give your personal thoughts and views and this might be a way to pull back from the children when needed. If I think I need to I introduce digital detox on a Sunday - no email, no social media nada! It's really good and usually enough to hit the rest button. I don't make any money from my blog because it is purely a hobby, something I'm passionate about and I'm worried, if I turned it into a job (not that my stats are anywhere near good enough for that anyway!) that I would not enjoy it any more. I hear you and i feel i cant take a break otherwise i'll not get the money/things we need and my family is kind of dependent on me blogging. Even when im sick. 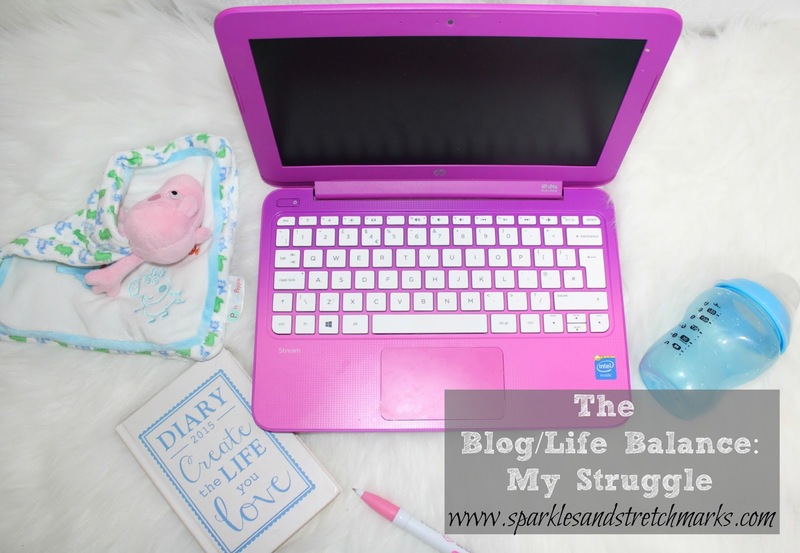 I also worry about th efeeling used but at the end of the day we are blogging to give our children nice things, experiences and opportunities. I will when I can afford it begin a savings for my daughter and then she can have something when she is older as a form of thankyou for helping mummy with photos and videos etc tec. She also now she is older gets paid for time- when we do clothing shoots etc and she sees it as a little job. Its not easy but you do have to cut out what is not working for you. Ive decided to cut out my feature on my puppy as some people liked it but it is not my target audiecne and not helping me to earn. Sad but true! I think in this day and age it is so easy to get carried away with recording and forgetting to live in the moment but I think realising is the first step, identifying what should stop is another and I think you're on the right path. I I'm really bad on work life balance. I work full time, and then blog/promote etc for around the same amount of time. I rarely video though so that takes some pressure off. I scheduled when I has g and had a break. It's hard but I just had to do it and, come Christmas Eve, apart from his monthly update on the 28th, I'm having a break. I'm definitely been struggling with the work/ life balance . I've not really been organised with it this year so am making sure that next year I have a plan in place. I've started blogging in the evenings and doing blog photos when Blake is having a nap unless he will need to be in them. It is tough - I struggle with the same thing. For me blog is a hobby although it does bring some monetary opportunities too. I have a full time job so the balance can be difficult to achieve. I an imagine that when you are work from home and an entrepreneur it is so difficult to draw the boundaries, as you feel like you could and should do just a bit more. Ah, difficult isn't it!